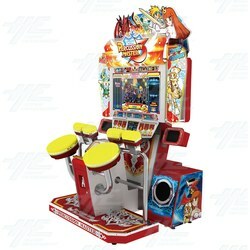 Advanced drum simulation game with over 130 popular English, Japan, Korea and Chinese songs, new online competition mode and drum challenge mode, along with ability to take live pictures of the players with its included digital camera, then superimpose them onscreen to make them really feel like drum superstars. The colorful, dynamic cabinet attracts attention, and is designed to encourage first-time usage. Game signage and video images easily explain how the game is played. Players have a pair of drumsticks (which are attached to the cabinet) and 6 drums. The game displays hit symbols, color-coded to a specific drum while the player listens to the music selected and attempts to hit the correct drums. Drum sensors detect the hits. Larger drums sometimes need to be struck with both drumsticks, and players may need to execute “rim shots” in order to keep up. Percussion Master 3 comes over 130 great music tracks, which players can select two from, and has many game modes and difficulty levels, along with new online play options and over 20 festival and online contests to choose from, so everyone from a novice drummer to experienced skin masters can play. Players can choose to play solo, or compete with another player in different game modes. Advanced drum simulation game with over 130 popular English, Japan, Korea and Chinese songs, new online competition mode and drum challenge mode, along with ability to take live pictures of the players with its included digital camera, then superimpose them onscreen to make them really feel like drum superstars. The colorful, dynamic cabinet attracts attention, and is designed to encourage first-time usage. Game signage and video images easily explain how the game is played. Players have a pair of drumsticks (which are attached to the cabinet) and 6 drums. The game displays hit symbols, color-coded to a specific drum while the player listens to the music selected and attempts to hit the correct drums. Drum sensors detect the hits. Larger drums sometimes need to be struck with both drumsticks, and players may need to execute “rim shots” in order to keep up. Percussion Master 3 comes over 130 great music tracks, which players can select two from, and has many game modes and difficulty levels, along with new online play options and over 20 festival and online contests to choose from, so everyone from a novice drummer to experienced skin masters can play. Players can choose to play solo, or compete with another player in different game modes.